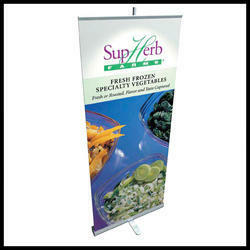 Shapes Collection Banner Stand gives you visual impact and depth with layered graphics. Front panel can be profiled in several shapes to complement your message and brand. Bases protect retractable graphics during transportation and storage. The base also contains Skyline’s Graphic Exchange System which allows you to easily change your graphics on-site. Simply insert the shockcorded support pole into the base then raise and attach the graphic panels that are housed within the base. Communicate your message in style with vibrant fabric or UV graphics. Skyline graphics are durable and long lasting so you always look your best. Telescoping light fixtures are easy to attach. Choose from durable and energy-efficient LED or 50 watt halogen. 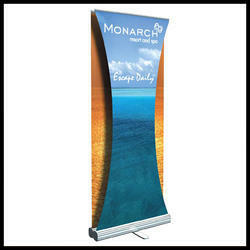 Designed with built-in merchandising, Myriad gives you the ease of a banner stand with more flexibility. Acrylic and metal shelves and literature holder available. Holds up to 4 lbs. (8.1kg) per pole. Myriad's fabric center panel gives you a full backwall display using only 2 units (base and graphics) so you reduce weight and cost. Center panel can be flat or arched. 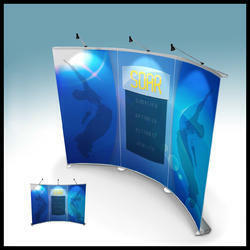 Myriad's arched center panel gives you a look distinct from traditional banner stands. Myriad's base has the Skyline Graphic Exchange System, which allows you to easily change your graphic panels. A single Myriad unit packs in a soft-sided, compartmentalized case for protection. The case has a shoulder strap for easy transport. Add a functional table! Three Myriad units pack into an oval case that can transform into a useful and stylish table. Looking for “Skyline Banner Stand”?